World famous winery in the area Sauterne (Graves, Bordeaux). In the Bordeaux Classification In 1855, the Château was the only one to be awarded the "Premieur Cru Classé Supérieur", making it the most highly classified winery in Bordeaux. 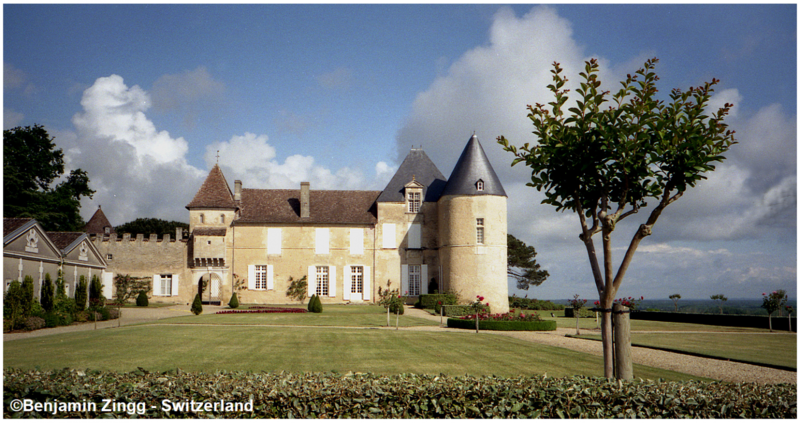 The castle overlooks the surrounding vineyards of Sauternes on a 75 meter high mountain. In 1993, the 400th anniversary was solemnly celebrated. During the English rule in Bordeaux in the period from 1152 to 1453, it was in the possession of the English crown and then belonged to the French king Charles VII (1403-1461). A Jacques de Sauvage leased it in 1593 (which is considered a founding year), and was bought by his descendants in 1711. The later US President Thomas Jefferson (1743-1826) visited the estate in 1787 and after a tasting sent 30 bottles to America to his friend George Washington (1732-1799). From the noble family, the very elaborate and costly wine production was developed, no other good used for it so much effort. Who actually was the first in Sauternes, who made a noble sweet wine, there are different versions. Jefferson certainly did not know the dessert wine in its present form, but it was then still produced in the manner of the "Y" (see at the end). Legend has it that one of the descendants of the family returned in late 1847 from a trip to Russia and only through Botrytis shrunken, noble rotten grapes found. He therefore ordered a "late harvest". Another variant says that even before the then German owner of the Château La Tour Blanche had experimented with the production of noble sweet wine. The first vintage of d'Yquem, as we know it today, was definitely the 1847s. The Russian Grand Duke Konstantin Nikolayevich (1827-1892) tasted the wine in 1859 and brought it to Russia, where he became an absolute fashion drink under "Yquem". The present vineyard of 106 hectares on sandy gravel and clay soil is planted to 80% with Sémillon and 20% Sauvignon Blanc. The quality criteria are extremely strict, so there was no production at all in 1964, 1972, 1974 and 1992. The production is very expensive. Every year about three hectares of vineyards are cleared and only after three years fallow newly created. There will be no pesticides is used and fertilized only every three to four years with horse manure. In summer, the leaves of the grape zone are removed, exposing the berries to maximum sunlight. The usually starts in mid-October and, due to the complex practice, often extends into December. The grapes are carefully hand-picked by about 120 harvest workers (specialists) in at least six to eleven Tris that is, passages harvested (as in 1972, the 11 Tris were spread over 71 days, yet there was no Château d'Yquem). Often, only a few noble rotten berries are picked from a grape. The yield is extremely limited (maximum 9 hl / ha) and delivers only a fraction of a normal white vintage. Only one glass of wine is produced from a vine (about one bottle in normal wine), which produces about 1,000 bottles per hectare. Every year, only about 80,000 bottles of the sweet Château d'Yquem (and 20,000 of the dry white wine "Y") are produced. The individual daily harvest quantities (journée) are fermented individually. There is a threefold Press the mash and the must these three acts are mixed. The fermentation takes place at 20 ° Celsius and lasts for two to six weeks. Thereafter, the wine contains 13 to 14% vol alcohol and 80 to 120 g / l residual sugar, It is given without clarification in 100% new Barrique barrels, which are only filled to two-thirds. Every three months is tapped and transferred, but the barrels are never completely filled. The total loss is 20%, so every two weeks a replenishment takes place. There is a repeated beautiful (basically without protein), but none filtration, After an expansion of at least three and a half to four years, the assemblage takes place, whereby usually 80% Sémillon and 20% Sauvignon Blanc is used. Every single barrel is tested and, depending on the quality of the vintage, a portion (at least 10%) is removed and sold in barrels. The lusciously sweet taste of the wine is incomparable, it smells intensively of honey, its color changes over the years to pale gold. The outstanding vintages are 1784, 1811, 1814, 1825, 1847, 1921, 1929, 1937, 1945, 1959, 1967, 1970, 1971, 1975, 1976, 1980, 1981, 1982, 1983, 1984, 1985, 1986, 1987, 1989, 1990, 1991 and 1994. Many of them are not yet at their peak. The well-known Swiss Degustator René, judging by the 20-point system Gabriel even awarded 21 points for the year 1937 and described this as "over wine". Incidentally, in 1998 one of the famous German wine collectors Hardy was found in Munich Rodenstock (1941-2018) organized now legendary and described in a book tasting with 125 different sometimes very old Château d'Yquem vintages instead. Since 1959, a dry white wine from non-noble rotten grapes is produced in half Sémillon and Sauvignon Blanc, which bears the idiosyncratic name "Y" (French Ygrec = Ypsilon). This is similar in flavor and in alcohol content, but has only a very sweet hint of sweetness (and is much cheaper). But no second wine is produced.